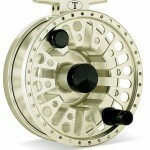 Fly reels have come a long way from the Pflueger Medalist you used growing up. Some weigh next to nothing, while others have enough drag to stop a truck. Manufacturers have achieved these new levels of performance by using new materials and cutting edge design. But how do you tell the difference between cork and Rulon drags? Is Delrin smoother than graphite? 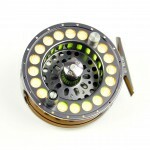 Throughout the years a lot has been written about fly fishing equipment. Blogs, forums, magazines, manufacturers are full of information. There have even been several head-to-head tests of fly rods. Reels, on the other hand, have been virtually ignored. Why? Fly Reels are hard to test. It requires a lot of expensive equipment, knowledge, and time. We set out to break that mold. We wanted the test to remain objective, so the first part of the test is purely scientific, and we’ll give you all of the raw data to draw your own conclusions. But, we’re also going to tell you which reels we like best. Help us keep writing awesome reviews. 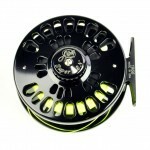 Buy your next fly reel here. 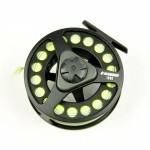 What makes a great saltwater fly reel? That’s the question we asked ourselves when we conceived this test. We asked around. We wanted a drag that could stop a fleeing bonefish, yet was smooth enough to protect light(ish) tippets. We also wanted a reel that was light enough to cast all day long, and one that could hold enough backing (at least 150 yards) in case that baby tarpon turns out to be bigger than a baby. Finally, we wanted a reel that could pick up line fast with minimal level winding and withstand all of the rigors of saltwater use. All spool measurements were taken using a digital caliper and weights were captured using a digital scale. Testing the drags was the tough part. Luckily, we teamed up with the folks at Admet, the makers of the best universal testing machines on the market. They set us up with one of their fully customized eXpert 2600 Dual Column testing machines. 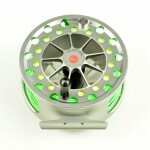 Each reel was then filled with backing and attached to the base of the eXpert 2600 via a custom machined reel mount. The backing was then attached to a hook which is attached to the load cell. We then set the machine in motion and measured the force nearly 1000 times per second. Richard Gedney, founder of Admet, explains this in more detail. We tested all reels with backing only. We found that when fly line was on the reel, it shifted around too much to get consistent results. Rigging Matters. When a bonefish turns and starts swimming toward you, you need to reel as fast as you can to keep the fish on. It also means fewer turns to bring in that trophy catch. Therefore, bigger IS better, as they say. For those of you who don’t know, the arbor refers to the mid-section of the spool. Think of the hole in the donut. Following the analogy, the larger the diameter of the hole, the larger the arbor. All of the fly reels we tested claim to be “large arbor”, but we discovered that there was quite a variation between reels. As you might expect, the classic Tibor Everglades was the smallest at 1.58 inches, nearly 42% smaller than the Ross F1 at 2.73 inches. This calculation isn’t exact because some of the spool designs featured arbors that weren’t flat, but it does give us a basic idea of reel capacity. While all the reels we tested were “8-weights”, there is clearly no standard here. 200 yards of 20lb Dacron takes up about 2.2 cubic inches when wound reasonably tightly. The largest reel could easily take an extra 100 yards of backing. Side note: Because this category is about flexibility, and the Hatch 7 Plus also accepts a Mid-Arbor Spool, which is even bigger than the 8080, we decided that they would share the victory. As fly fisherman, we’ve become obsessed with weight. Rods are pushing the limits, some weighing in at less than two ounces. Reels are getting lighter too. Why are lighter reels better? As rods get lighter, you need lighter reels to balance them. Moreover, when you’re casting all day a lighter outfit is easier on your arms. The lightest reels in this test were lighter than most trout reels, while the heaviest weighed in at over 9 ounces (over half a pound!). 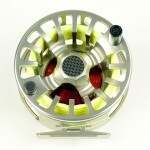 We tested reels from $100-$800. Prices don’t necessarily correlate with performance, the Orvis Mirage took 3rd place in our test, and cost hundreds less than the most expensive reels. 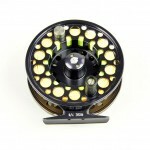 We were even more surprised when the Sage 1800 reel, the least expensive in our test, tied for 4th place. So, what are you paying for? 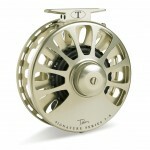 The more expensive reels tend to offer a greater level of customization. Abel lets you customize virtually every single part of the reel (even the drag knob and reel seat), and even offers hand painted options from great artists like Derek DeYoung. Tibor offers custom engraving and some of the most beautiful metallic finishes ever created. 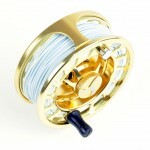 A sealed drag is a key component of any good saltwater fly reel. It keeps salt and sand away from all of the important parts. But, there’s more than one way to solve this problem. Classic reels like Tibor and Abel have proven this through countless world records. By using very few parts, and making them easy to access/service, they’ve achieved great results without “sealing” the drag. We weren't able to fully test the quality of various drag seals (this is typically done with a “freeze test”), but we do know that some drags are more sealed than others. For the purposes of this test, we scored reels with male/female connections lower than the drags with machined connections like Hatch and Hardy. 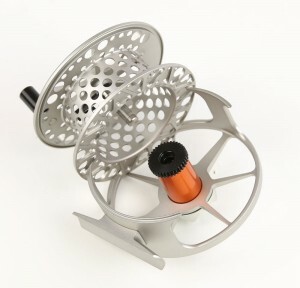 Note how the reel on the right requires you to insert a rod into the drag system, where the Hardy (left) attaches the spool directly to top of the drag. Sound is an important, yet often under appreciated, part of a fly reel. Drag sounds provide a lot of feedback when fighting a fish, which is useful, but they also add to the excitement of catching a fish that makes a great run. At Trident, we prefer reels that have both an incoming (when reeling in) and outgoing (when the fish is taking the drag) sound. We knew that reels like Tibor sounded great, but we were surprised to hear (pun intended) how well the Ross Momentum LT sounded. It's great! 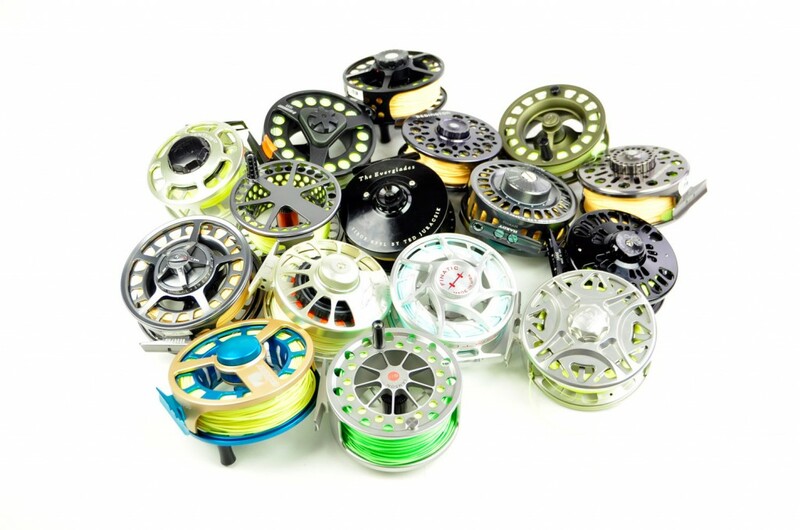 We can talk about fly reel performance all day long, but when it comes down to buying a reel, look and feel is just as important. 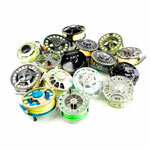 That’s why top reel manufacturers offer dozens of custom colors and 100s of possible combinations. This is purely subjective, but there's unlikely to be many people who prefer the feel of a Redington over a Tibor. So, we gave you our opinions on the matter. A few of the reels also had some interesting special features, like the Sage 8000's "Dial-a-Drag", which allows you to pre-set your drag level as you pull off your fly line. Abel also built their reel with VERY few parts, making it incredibly easy to service. We gave these reels an extra point for ingenuity. Want to know about spare spools and changing the retrieve? Check out our reel notes at the bottom of the page. 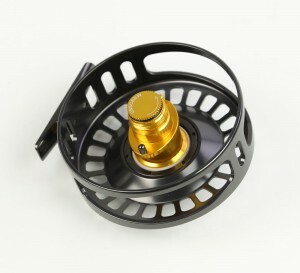 When you're spending half of your paycheck on a fly reel, it's important that you know the manufacturer is going to stand behind it. Thankfully, every reel we tested came with a lifetime warranty from the manufacturer. Unfortunately, there's a "handling fee" associated with it. Except for Hatch. They stand behind their product so much that they don't even charge you a fee if it breaks. We scored this based on the % of the original purchase price the fee was. 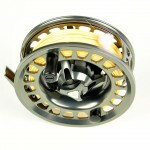 What differentiates a freshwater fly reel from a saltwater fly reel? Drag Strength. When you’re trying to stop a bull redfish, 3-4lbs of drag isn’t going to cut it. Ideally, you’ll want enough drag to match your tippet size, less a few pounds of water drag (the force of the water on the line). For bonefish, that means at least 8lbs. Baby tarpon or big stripers – 10-12lbs. 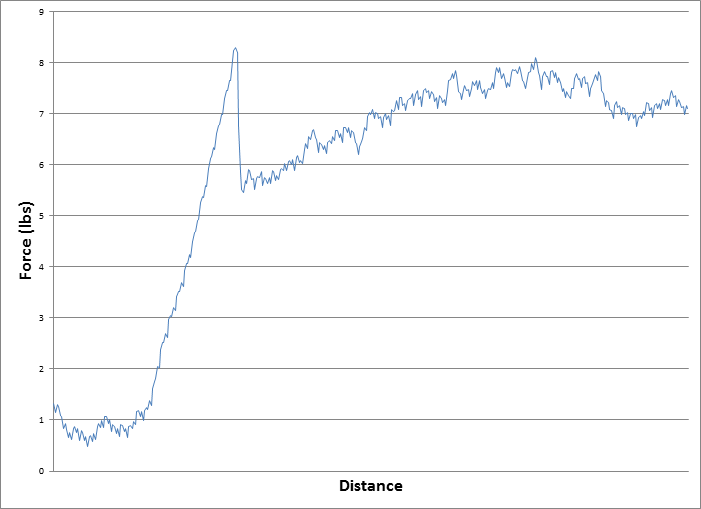 If you troll the fly fishing forums, there's a lot of talk about start-up inertia - and with good reason. But let's back up. What is start-up inertia? 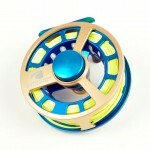 All drags work in essentially the same way - two plates create friction which slows the spinning of the spool. There are two types of friction: static - when the drag isn't moving - and kinetic - when a fish is pulling on the drag. 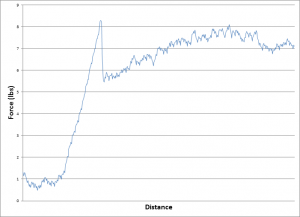 Start-up inertia is the initial force required to get the drag started. So, it's actually a bit of a misnomer. It should actually be called "static friction". So... who cares? You'll notice that this reel requires over 2 lbs of start-up force. If we're using 8 lb test tippet, we now need to set our drag to a maximum of 5-6 lbs so that it doesn't break the tippet. Effectively, we're losing 25% of our drag strength. Because all forces are exacerbated at higher speeds, imagine how much drag is lost with a bonefish traveling at 15-20 miles per hour. Needless to say, we were very surprised to find out that start-up inertia was actually fairly low for most reels, but a few reels really stood out. The Hatch Finatic and the Ross F1 both had virtually zero start-up inertia. When we saw how good Admet's machines were, we were planning on including a category for "drag smoothness". When we tested it, however, we found that most of the drags were actually very smooth, and would have no impact on any real fishing application. In fact, the testing machines were so accurate, that we found that the position of the line on the reel made more of a difference than the drag itself. So, we didn't score it, but if we had, the Ross F1, would have been the winner. We weren't all that surprised when we tabulated the results and the Hatch Finatic 7-Plus turned out to be the winner. 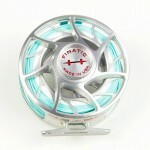 Everyone that's ever picked up a Hatch fly reel knows that they are an incredible piece of equipment. It's beautifully machined, and has a silky smooth, very well sealed drag. They also have the best warranty in the business. If we had to find something wrong with this reel, it would be that it doesn't have as much drag as we'd really like to see. 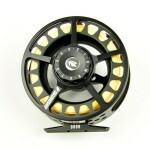 Counterpoint #1: Which reel will I be taking tarpon fishing? Easy. The Hardy Fortuna X. When drag performance is what matters most, Hardy is the unconditional winner. Counterpoint #2: If you're only going to be using your reel in freshwater (or for relatively small fish), the Ross F1 offers the smoothest drag and the most protection for light tippets. We'd love to hear your feedback on this test. Please leave a comment below. If you've gotten this far, I commend you - it's a novel. Don't forget to check out the other posts in our great fly fishing blog. If the Hardy and Cheeky get 9's for look and feel, then the Hatch deserves a 32. Great article! You should also look at doing a 5/6 weight review. Great article, but I would not have included "price" in the scoring. Obviously price is important, but does not necessarily reflect on the quality of the reel, which is what the test was about. If you take those "price" points out of the final score, a very different picture emerges. Then it is up to the angler to decide if they want to spend the money. Great article! I would like to see how the rank changes when based on true performance factors (by either taking out the more subjective data points like price, look and feel, sound, warranty, etc. OR by weighting the performance factors more heavily in the scoring system). 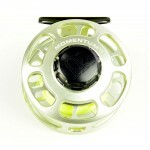 Regardless, it's very good information when considering your next salt water reel purchase. Good job on the review. "Price" is a factor, not all of us can afford the top of the line reels. 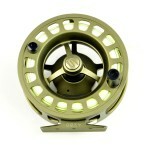 Nice to see that the Sage 1880's quality kept up with the more expensive brethren and this may be my next reel. How about a 10 weight challenge? I agree with the 1st comment, Nautilus would have been a great addition since they are definitely a market leader in this weight class and Hatch's main competitor in the "modern" style, high end, sealed drag saltwater reels. Also a point of note, teh Cheeky, while cool looking, looks to me like it comes off the same line and has the same drag mechanism as the Wright & McGill Sabalos reel that is similar looking and half the price. The Allen Kraken seem like it might be the same core as well, also in the $200 range. That said, I they may all be great reels, I have handled the Salabos and it seemed very well put together, but it seems to me that Cheeky is asking about twice as much as they should be for a outsourced Chinese reel compared to others. 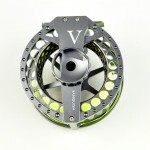 I am looking at 12wt reels right now, trying to apply your review to the increased size. Do you think anything changes between the Hardy and Hatch at the increased weight? Do you have recommendations in the money is no object category and another in this is the best buy category? Jon, thanks for the comment! I would say that nothing changes between Hatch and Hardy in the X3 vs 9-Plus race. The Hatch comes out on top because of increased line pickup. 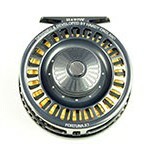 To answer your question... Money no object: Hatch 9 Plus, Nautilus NV-G Best Buy: (I hesitate to call a 12wt a best buy...) Cheeky Thrash, Silver King, Orvis Mirage. Nice article. I agree with these reviews. Admet is a professional material testing company.